All animals are vulnerable, but some more than others. A hundred years ago, even fifty years ago the bonobo, the forest elephant and the okapi were among the least hunted species in Congo. A fortuitous, but unfortunately short term “right to life”. These animals do not withstand pressure from poaching. They are an extreme contrast to rabbits and mice: they birth only one young at a time, they have long intervals between births (>4yrs for bonobo), each pregnancy is many months (>20 for the elephant and >14 for the okapi), and they do not reach sexual maturity quickly (elphant at 9 to 12 years and bonobo have their first young between 13-15years). So, once their populations are reduced they don’t bounce back and, alas, they are easily reduced right down to local extinction. In TL2 these are our most vulnerable animals. 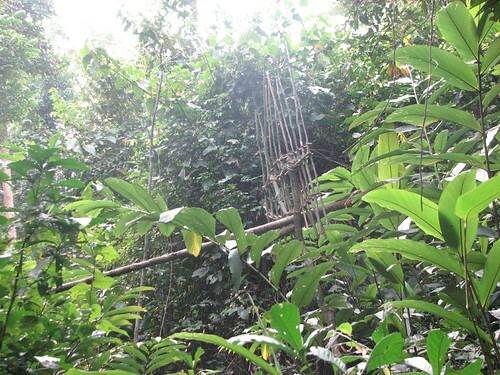 Even fifty years ago guns were scarce in DR Congo and metal wire for snare traps was a rarity. These, the Big Three, bonobo, elephant and okapi, were abundant, each in its own area of forest. Local people, forest people, understood their special status. In some areas they were taboo –custom forbade killing or eating them –and in other areas, where they were hunted, it might be only older men who were allowed to kill them. 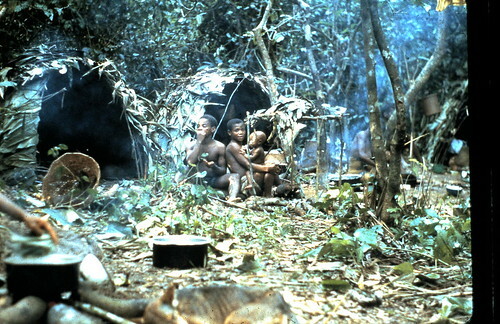 A traditional hunting camp of the Mbuti pygmies in the early 1980s. 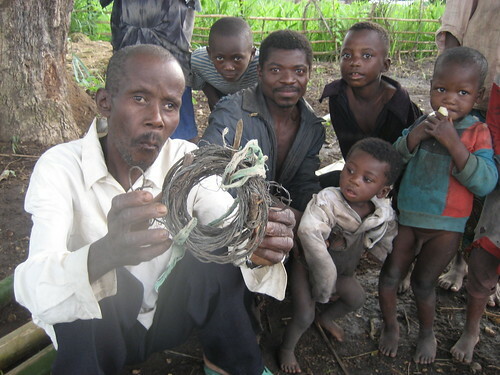 They set off daily for net hunts, with nets made from the local forest liana they call Kusa. No nylon, no wire. 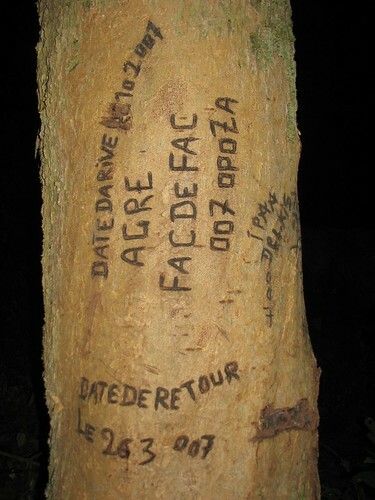 This was the case in the Ituri Forest where young men risked too much by killing a potent animal like the okapi. The forest might get angry and then they would only have themselves to blame if their wife had a miscarriage or the toddler “lost his breath” and died. This wire is used to make snare traps. Traps don’t choose. Any animal that steps into it is caught. Even where taboos did not exist, the means for killing the Big Three required a maximum effort for a minimum success rate. Much easier game was the little antelope or the monkeys that moved in large troops. These smaller animals could be caught with a bow and arrow or in the hunting net; they were also less vulnerable to extinction. To capture elephant or okapi a deep pit had to be dug, covered and disguised, then checked regularly. Occasionally, an okapi or elephant was pursued on foot and speared. To actually kill one was unusual, a cause of celebration, for song, for appreciative quiet. If an elephant, okapi or bonobo was killed, then the familiar spirits of the forest had to be placated. But, with the long civil war that ended the last century and started this century, military with assault rifles have invaded even the most pristine areas and have changed the vulnerability status of the Big Three. Strangers, unfamiliar and insouciant of local custom, saunter through villages, hungry, unpaid, but with weapons of war slung over their shoulders. Now AK-47s are widely dispersed, hunters move huge distances in search of elephant. They are transients with no use for local taboos. They have no ancestral attachment to the spirits of the forest. Okapi: Found only in DR Congo, mainly in the northeastern forest but also on the west bank of the Congo River in the TL2 area. They are the lesser known members of the giraffe family and are rarely seen despite their large size (that of a small horse) because of cryptic coloration and long periods of immobility. Okapi are solitary. In relatively rich forest, females have the smaller home range, four to five square km, while males, although smaller, have larger home ranges overlapping those of several females. 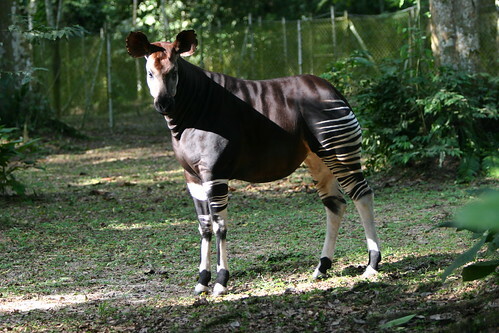 Okapi are ruminants. They eat only leaves, and only leaves of specific species, stripping the young leaves from branches with their long prehensile tongue. Officially each of these animals has national protection. Our hope is that we can help make that a reality. Everyone who hunts for subsistence or for gain in the forests of the Big Three can avoid killing them easily. A forest in which any of these three animals is allowed to exist in peace – is a forest of hope. This entry was written by Terese Hart, posted on 2008-02-03 at 2:40 am, filed under Bonobo, Bushmeat, Elephant, Okapi. Bookmark the permalink. Follow any comments here with the RSS feed for this post. Post a comment or leave a trackback: Trackback URL. First of all, let me say I’m embarrassed by my previous comments about women being the leaders in primate research! Blame it on my preoccupation with Dr. Leakey’s Angels! As I read today’s post, I realize the collective effort all this research takes, so Ashley and John, please except my apology. The Okapi are stunning, aren’t they? 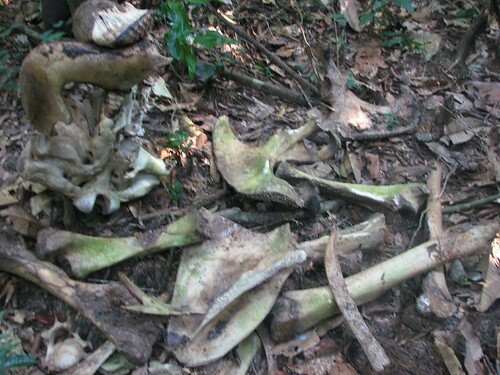 You mentioned the forest elephants returning to the site of their deceased members, I have heard of elephants, gently handling the bones of family members, as if in mourning. My God, the full capacity of these amazing creatures has yet to be explored. And then we come to our bonobos, yes we must save them at all costs, to lose them, we lose a part of ourselves…and we won’t let that happen! Hey y’all, the last two posts are very interesting, if difficult to read. I’m a vegan, so I don’t use animals for any purpose and I think the world would be better if none of us did. So, this sort of thing is difficult for me to read but I appreciate your efforts very much. Yes Sheryl, ditto. But I’m very concerned also with the transmission of viruses, however an empty stomach will win out over what may happen to them, perhaps years later, as these viruses can lay dormant for sometime! Maslow’s theory of hierarchy is based on the premise that basic physiologically needs be met first, ie food, water, and shelter. Only when these needs are satisfied are humans able to grow and be aware of other’s needs (the forest and the animals). The basis of our agricultural project at Obenge is to see if we can convince local villagers to grow crops for subsistence and for profit (sale)and reduce hunting. The gardens in Obenge (one picture in Dec 06 post,and another in Nov 22)are apparently producing very well…. we will definitely report back on these projects. But it is hard to exaggerate the universal presence of bushmeat hunting and bushmeat commerce…until the bushmeat runs out–that is. 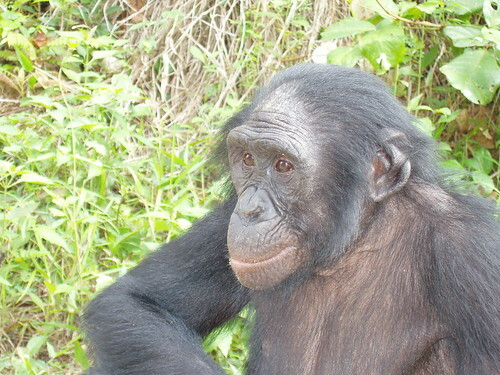 The Bonobo Conservation Initiative provides a link to the Bushmeat Crisis Task Force, where conservationists discuss diferent stategies employed to lessen the impact of the bushmeat trade. They discussed sustainable crops, wildlife farms (small mammals such as cane rats, bush hogs, etc.) to be used as a viable protein alternative, and of course education. Terese, you have talked about all of this in your posts. We may not like the choices, but if it comes down to someone eating a rat or a bonobo, I think you know where we stand. Yes, in the end, to really make a difference we are just going to have to push for what we think is doable. Completely stopping bushmeat won’t happen in my lifetime and not until there are, unfortunately, many fewer animals to be killed BUT if it can happen sooner because farm-raised bushmeat is available, that is a very good thing. And in the meantime we will continue to push for protectable areas to be set aside as well as universal protection of a few particularly susceptible species. Just checking into make sure all is ok after that 6.0 magnitude earthquake. I hear from Roxane at the JACK blog in the DRC that there is lots of rain and local flooding. Please let us know how you all are doing. Everyone that we know and work with in Bukavu is OK, but Olivier Kisumbu’s house is destroyed and many others have “cracks”. 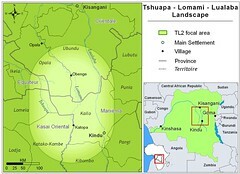 Olivier guided me in November when I went to the Luama protected area. Pictues on Flickr….a really good guy. These are people with no surplus of resources and no insurance…. Relieved to hear everyone ok. Sorry about Oliver’s house, why is it the people who least can afford it, get nailed? !